LEVONTA is the unique authorized seller on Amazon. Please pay attention to avoid purchasing counterfeits. Counterfeits 100% differ from the original in quality and package. Quality warranty:We firmly stand by the quality of our products and offer 30-day full money back warranty if you are not delighted. No question asked. Beautifully designed pocket watch make great anniversary gifts / birthday gifts / Christmas gifts / Fathers Day gifts / wedding gifts / Valentines Day gifts / Graduation Gifts / Memorial Gifts for men. 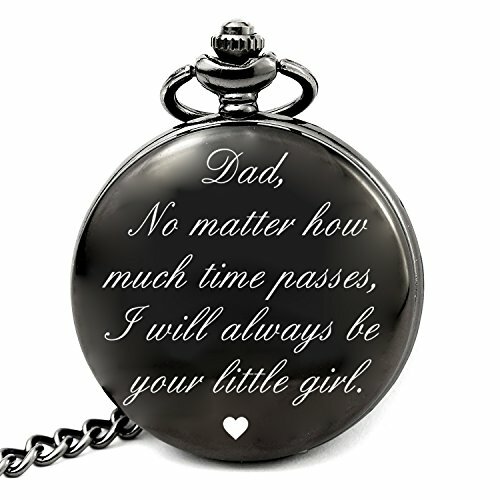 Engraved pocket watch gift idea featuring the words "Dad, no matter how much times passes, I will always be your little girl."